"You are a true artist and a Godsend to these patients!! !” - Edward H. Yob, MD Past President, The American Society of Moh's Surgery"
We see patients from all over the globe. Our office staff can provide you and your family with everything from help finding accommodations to local attractions to enhance your visit. I am deeply grateful and ever so appreciative of your truly welcome and much needed help! Your surgery results are nothing short of awesome! Thoughtfulness like yours indeed takes a special caring. Again, ‘Thanks a Million’ for everything!! I wonder how you create a living thing with your hands. How do you build something out of nothing? The thought of the task baffles me, but to my father, it is mundane. I wanted to take a minute of your precious time to thank you and to let you know the true meaning of what you have restored in her. Yours is a truly special gift and the confidence in which you handled her case allowed her to focus on healing, not worrying! I feel great every time I look into the mirror. Thank you for that gift. Needless to say, I am overjoyed at the acquisition of my new nose - something I never imagined I would need - turned out so splendidly. It is a wonderful gift that you bring the world with your expertise, your care, and your artistry. It replaces despair with hope and, indeed verges on the miraculous. My deepest thanks. I think of you every time I look in the mirror and know how blessed I am to have you as my doctor – the genius….. Everyone tells me how beautiful I look and they are amazed at your ability. Thank you for making a nightmare experience quite pleasant and even fun at times…. We have so much to thank you for. You were beyond considerate and we are beyond grateful… I get compliments almost every day on my beautiful nose. You are really a miracle worker! My nose is healing rapidly and I feel normal again - a delicious feeling. I am so happy for getting the surgery. The surgery has changed the outlook I have about myself and my self-confidence. So thanks again because how can I repay someone who has changed my life. You truly gave me a new lease on life, as the saying goes. My nose is absolutely beautiful; I still get compliments on it! Thank you so much for taking such great care of our son. We couldn’t have made it through all this without your kindness and compassion. Words will never be enough to express our gratitude for the work you have done with our daughter. You have made her a whole person again. From the first day we met you, we had unending hope for her. You plainly said you could fix her when everyone else warned us not to expect much. I would like to take this opportunity to tell you what a magnificent doctor and artist you are! My two surgeries a few months ago - nose repair and facelift - changed my life. Everyone remarks how beautiful the work is. I feel I have lived on both sides of appearance; that is, going from droopy and haggard to looking vibrant and pleasing. There is rarely a day that goes by that I don't Thank God for sending me your way. My nose is beautiful. Magician performs excision: arm scar disappears! We are back home...The result is fantastic and completely in line with the vision I had in mind. Thank you for understanding and making that vision a reality. The vastly significant improvement to my breathing will certainly enhance my overall health and quality of life as well. I have the best of both worlds in aesthetics and function. I am beyond happy and satisfied. Your staff is attentive, warm and caring. Thank you for giving me my identity back. While I could have lived with the scars from the dogbite, my psyche feels better knowing that I present the best face I can- with your help. Thanks for sharing the benefits of your skills with me. I am honored. I am thankful every day for what the Doctor was able to do for my daughter. I don't get on your side of town during working hours very often. I think in another month or so I will be over there and would just like to stop in real quick to shake your hand and thank you for my beautiful nose! Everything is going great. It gets better all the time. Thank you very much for being brilliant, talented, and fun to be with. It was an amazing journey and the confidence Harper and I have in your skills made it easy to keep the Faith. We will never believe that we have said "Thank You" enough. God richly blessed our package of three, and it is important to include the hundreds of people that joined us in the long process. The kindness and helpfulness of Rachel and Tina your office staff. I have been thinking of you and wondering how you are. My son will turn 18 soon and he is doing very well. His surgery all started with you and now he is almost grown! He wears a BAHA, a bone conducting hearing aid. I just want to say thank you for your very tender care of my son. His mom passed away nearly 4 years ago and I know she would join me in extending this thank you! You are a pretty decent ear maker too, and I would be willing to tell Dr. Brent! I wanted to tell you how thankful I am that you worked on me today. I think it looks terrific! Your work must be so rewarding. You are life changing to so many. Thank you! I just want to tell you and everyone else at the office, THANK YOU! You helped make my dreams come true with your patience and superb hospitality. I will be sure to tell all my friends how terrific this experience was for me. Thank you again very much! I am deeply grateful and ever so appreciative of your truly welcome and much needed help! Your surgery results are nothing short of awesome! Thoughtfulness like yours indeed takes a special caring. Again, "Thanks a Million" for everything!! I wanted to thank you again for the great work that you did on my nose. My wife and I are very pleased. You are truly gifted. God bless. Thank you for making a beautiful nose. I’ve always wanted a “normal” looking nose and without you I wouldn’t have had this life altering opportunity. You amaze me. My nose is healing very well and it looks great. I must admit that I am really loving my new nose! Thank you very much Dr. Menick. Your work is beautiful and so reminiscent of the Wabi Sabi concept but did you know that this advanced aesthetic concept is also a perspective and philosophy of life? Thanks for changing my life. I feel so vibrant and alive as a result of your work. Everything is going great and I have significant feeling in the nose. Once in a while certain vibrations (like singing) cause a most intense tickling/itching sensation. It’s kind of weird and exciting all at the same time. It gets better all the time. Thank you so much. I am writing just to let you know that I am very happy with my nose now. It really changed my life a lot, now I can take lots of pictures of my face (it doesn’t matter if the light is in my face), it always looks great and I am very confident meeting people, I don’t have to hide anymore. I had some concerns about the high bridge but after 2 months I started being 100% happy. All the rib pain in the end was worth it. Thanks a lot for what you have done for me and I hope you will make many other patients happy. 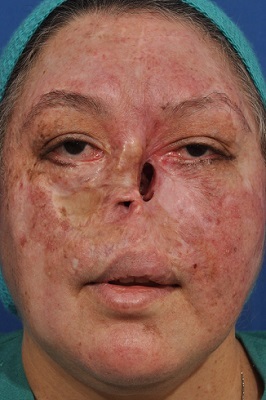 After the excision of multiple skin cancers, the forehead, cheeks, and lips were scarred and skin grafted and the nose ablated and irradiated. 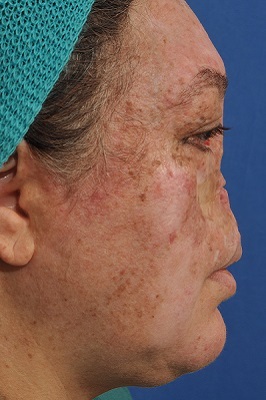 The defects were repaired with bilateral expanded cheek flaps with extensions to resurface the cheeks and lips, a microvascular radial forearm flap for nasal lining, rib support and an expanded forehead flap to resurface the nose. 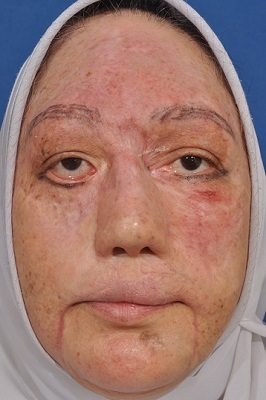 She is seen here 3 weeks after forehead pedicle division. 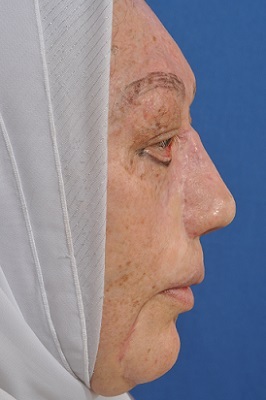 A late revision will refine the nasal and facial contours in the future.